With stock prices ascending to new non-inflation-adjusted heights and credit spreads thinning to post-credit-crunch tights, bubble talk is in the air for the first time since 2007. Recent examples include stories about stocks, loans, and credit more broadly. This chatter, as we explore ahead, is likely premature. Before diving in, let’s first define the term. According to Wikipedia, a speculative bubble is “trade in high volumes at prices that are considerably at variance with intrinsic values.” The online encyclopedia goes on to say, “It could also be described as a situation in which asset prices appear to be based on implausible or inconsistent views about the future.” Perhaps a simpler way to put it is that investors in a bubble are buying one dollar of value for two dollars in hopes that someone else will soon pay three dollars. Undeniably, financial assets and real property prices are richer today than they were during the low-liquidity/high-value period that followed the market crack-up of 2008/2009. When it comes to the loan market, however, even the credit curmudgeons might admit that today’s conditions are hardly in the same league as the boom-era periods. Rather, we are in the middle of the journey from bust to boom, and by most lights the pendulum is in mid-arc. The most frothy periods in the recorded history of the leveraged loan market were the late 1990s and 2006/2007 (the late 1980s also obviously qualify, but that period precedes the transparency provided by a loan index). Of course, these periods perhaps were not bubbles in the sense of Dutch tulips in the 1700s, dot-com startups in the late 1990s, or Florida real estate in the mid-2000s, but for the purposes of analysis they will serve us well. What follows is a discussion of how the current period compares to those two prior periods in four aspects: (1) credit terms of new deals, (2) risk profile of outstanding loans, (3) yield relative to risk, and (4) loan documentation. 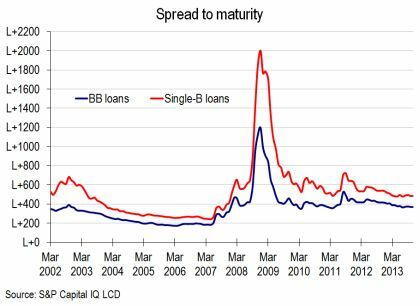 Credit profile (new issues): Generally, the credit statistics of today’s new issues are in the middle of the historical fairway, with few deals crossing at the heroic leverage and fashion-model-thin coverage of the prior two periods. 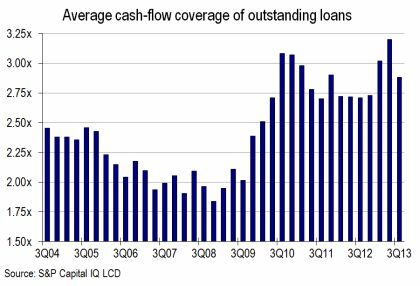 Credit profile (outstanding deals): Looking at the broader universe of outstanding loans, coverage levels remain healthy. 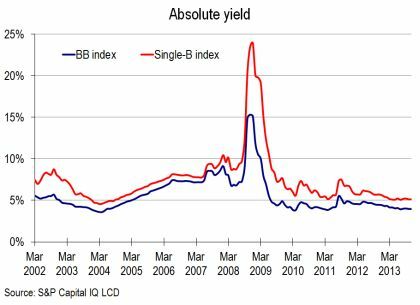 Yield relative to risk: Though today’s absolute loan yields are near all-time lows, that is largely a function of low rates. On a margin basis, spreads today are at about the historical average when accounting for the LIBOR floors in today’s loans, or a tick inside if LIBOR floors are excluded from the analysis. Structure: On this front, the loan document has clearly evolved to offer issuers unprecedented optionality, such as the widespread use of incurrence tests, incremental tranches, equity cures, and liberal change-of-control language. We’ll take each of these in turn. 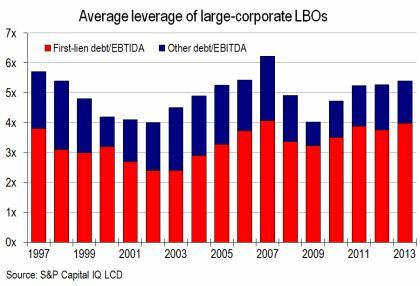 The credit profile of new LBO transactions is typically a good gauge of credit hygiene in leveraged finance. 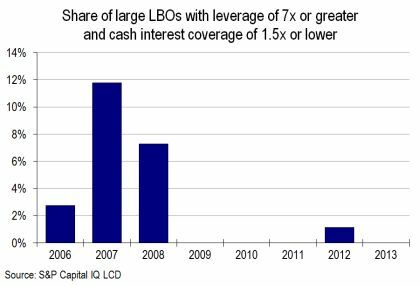 And, indeed, the average leverage ratio at which new large LBOs have been struck has crept higher in recent quarters from the more conservative levels of 2010-2011. In the past, such loans produced an outsized share of defaults when the cycle ultimately turned. By most measures, the credit profile of the loan market remains fairly robust. 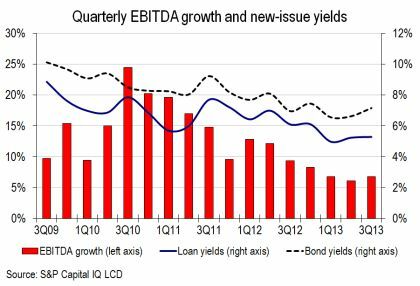 Loan issuers’ ability to service debt, for instance, has improved dramatically in recent years as a result of two salutatory trends: (1) muscular EBITDA growth since the recession ended in June 2009, and (2) shrinking financing costs. The result: fatter cash-flow-coverage multiples across the universe of S&P/LSTA Index issuers that file publicly. 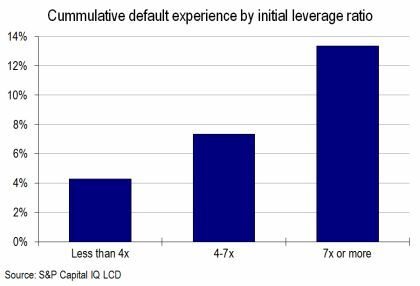 While wide coverage doesn’t rule out defaults, it obviously affords issuers greater wherewithal in the event of a downturn. Lining up the loan market’s current risk/return proposition with those of the past is a difficult exercise, given today’s historically low interest rates. In terms of absolute yields, today’s loans clearly offer a low prospective return. Loan spreads, naturally, are more generous. This chart shows the same trend but using the discounted spread over LIBOR. Putting this trend in context, as of Nov. 27, BB Index loans offered, on average, a discounted spread of L+368, which is 39 bps wide of the historical median level (we use median here because the heights of the dislocation skew the averages), while single-B loans were at L+484, or nine basis points wide. It gets more interesting when we exclude the benefit of LIBOR floors, which many players see as a way to compensate lenders for a particularly steep yield curve, what with three-month LIBOR lingering in the 0.25-0.3% range and 10-year Treasuries recently in a 2.6-2.8% band. 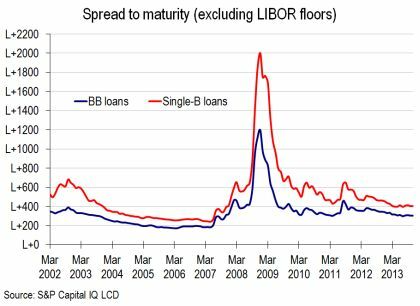 Excluding LIBOR floors, the current BB discounted spread is L+304, 10 bps inside the long-term median, with single-Bs at L+404, or 19 bps lower. Taken together, these metrics are further proof of a market sitting roughly in the middle ground between boom and bust. Looking at the data another way, the average discounted spread of the S&P/LSTA Index was L+471 as of Nov. 27, which implies an imputed default rate of 3.41%, outside both November’s reading of 2.08% and managers’ average forecasted September 2014 rate of 2.26%. As this chart makes plain, the margin of safety has tightened significantly in recent years in the face of robust market liquidity and consistent economic growth. 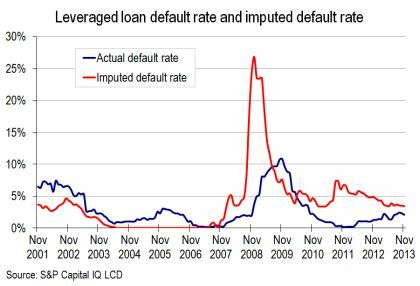 That said, loans are not priced today as if there will never be another default, as was the case in late 2006/early 2007. Where the factors discussed above suggest a Goldilocks scenario in the loan market, the erosion in documentation protections is the poster-boy trend of the bubble brigade. Covenant-lite is the most visible example. So far this year, 56% of new institutional loans cleared with only incurrence tests, far past 2012’s prior high of 32%. 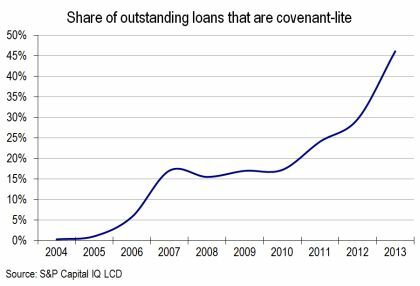 As a result, a record 46% of S&P/LSTA Index loans are now covenant-lite, up from 30% at year-end 2012. 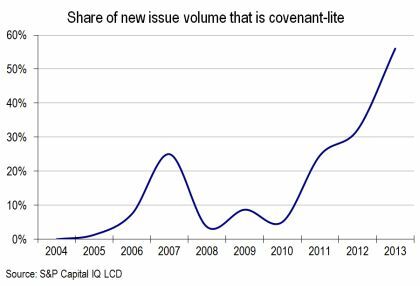 While covenant-lite structures are seen by managers as an unfortunate factor of today’s market liquidity that effectively forecloses the option to reprice a loan higher if the issuer gets into trouble, managers are more concerned with the expansive use of free-and-clear incremental tranches. MFN protection: Loans with the free-and-clear incremental provisions typically protect existing lenders with a most-favored-nation provision that resets the yield of the existing loan to within 50 bps of where the incremental prints (the definitions here are idiosyncratic, sources say). Average MFN protection in the year to date is 50 bps – with virtually all loans set at this level – versus 46 bps in 2012. MFN sunsets: Though typically proposed in the initial set of terms, most-favored-nation sunset provisions are usually dropped during the syndication process in the face of investor pushback. 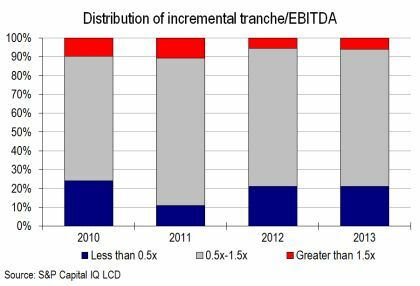 Indeed, just 4.6% of incremental tranches reported on by LCD News in the year to date cleared with a sunset provision. Some of the high-profile names in this exclusive club: CompuCom, Foresight Energy, Multi Packaging, and Fieldwood Energy. 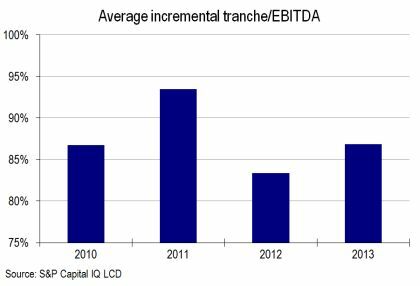 Sizing: Based on LCD’s data collection, the average free-and-clear tranche in the year to date equals 87% of trailing adjusted EBITDA, versus 83% in 2012. This average notwithstanding, participants say the rule of thumb is that free-and-clear incremental tranche sizes are equal to about one turn of EBITDA – with an unlimited amount allowed if the issuer is in compliance with the incurrence test and the other provisions of the document, such as restricted-payments and acquisition baskets. And, in fact, most of the deals LCD tracks are in a 0.5-1.5x range. More issuer-friendly documentation in the form of incremental tranches, incurrence tests, and equity cures may well be a direct response to the rising liquidity in the loan asset class, which allows managers to enter and exit positions more easily and therefore may obviate the need for the buttoned-up terms that were necessary when the lender was married to a loan until maturity or repayment. Of course, this is cold comfort to managers who studied credit at the old school and are concerned that today’s less-restrictive terms may result in less-favorable recovery outcomes down the road. Though we don’t have data to support it, the clear excess of the late-1980s LBO binge was deals for large, thin-margin retailers. In the late 1990s, blue-print telecom deals were where lenders’ money went to die. 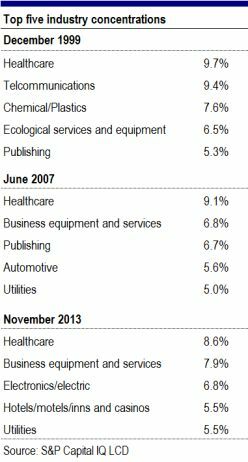 The excess of the mid-2000s was not strictly sector based, though certainly real-estate-related industries such as building materials, directory companies, and auto-related firms produced an outsized share of defaults. 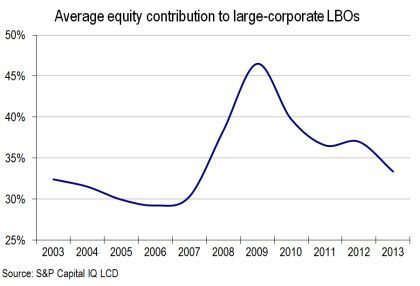 Rather, default rates were sent spiraling higher when large, highly geared public-to-private LBOs collapsed under the weight of the recession. At the moment at least, such a potentially catastrophic concentration doesn’t appear in today’s market diagnostics – though, to be fair, they call them blind spots for a reason. Also, as noted above, deals to issuers that either don’t have the benefit of positive cash flow or that geared at 7x or higher are non-existent (at least for now). 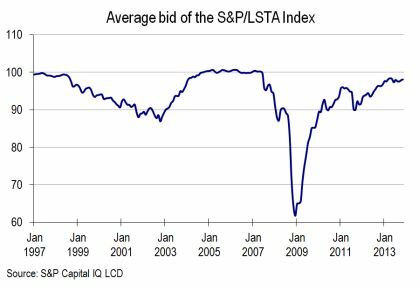 The black-swan move in loan prices that pushed the S&P/LSTA Index down an unprecedented 27.7% between September and December 2008 was set off by a liquidity crunch that until that point was unimaginable. During that four-month stretch, CLO issuance collapsed to a mere $1.4 billion and retail investors pulled $2.7 billion from the asset class. Of course, the most important and damaging factor was the unwinding of an estimated $50 billion-plus of market-value leveraged products, such as total-rate-of-return swaps and market-value CLOs. Fast forward to the present, and leveraged mark-to-market product is hardly a factor. Rather, the rapid ramp-up of loan mutual fund AUM is the potential liquidity drain that most worries loan participants. August 2011 offers a guidepost for what might happen if retail investors rush for the doors in response to a disruptive exogenous shock. During that fateful month, when Europe was threatening to come apart and political gridlock in Washington led S&P Ratings to downgrade the U.S.’s credit rating from AAA, loan mutual funds suffered $5.5 billion of withdrawals, according to Lipper FMI, or 14% of total AUM at the time. A similar run on the $158 billion of assets held in loan funds as of the end of October would mean $22 billion of withdrawals in a month. That alone, participants speculate, could push prices down by more than five points. To be sure, that’s not a 2008-level panic, but it certainly would be cause for concern among loan players. A final point on liquidity involves the underwriting calendar. When the boom turned to bust in 2007, the underwriting calendar for leveraged loans stood at a titanic $237 billion, creating even more pressure on supply and prices. 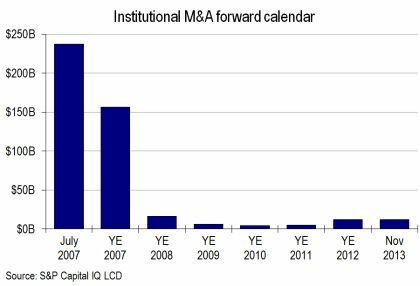 As of Nov. 27, the calendar of M&A-related deals held a mere $12.3 billion, at the narrow end of its 2013 range and just a fraction of the peak level of 2007. In a similar vein, participants say the amount of CLO warehouses open today is a shadow of the 2007 peak – of course, this is an anecdotal observation that is unsupported by data – and that the market therefore is less vulnerable to a slew of BWICs if arrangers were forced to liquidate unconsummated CLOs. Using this framework, today’s loan population seems weighted to speculative borrowers, rather than the Ponzi borrowers that predominated in 1999 or 2007 whose only hope of servicing debt in the long term was to grow, sell, or refinance at more amenable terms. Therefore, managers say, if we are on the road to ruin, it is at least a few exits down the highway. Credit vigilantes, true to form, are already on guard. Credit cycles always begin in the ashes and end in flames. Fueled by today’s turbocharged technical conditions, participants worry that 2014 may well bring a crop of more aggressive deals that push past 7x debt to EBITDA out of the box even after incorporating adjustments and synergies.